Tushar Garg – Director, Reverse Thought Creative Studio Pvt. Ltd.
Sunidhi Garg – Director, Reverse Thought Creative Studio Pvt. Ltd.
People today have turned into gadget freaks. As long as we have the Internet, web designers and devel­opers will be critical to our society. Even for busi­nesses, the digital medium is very important and today it has become even more crucial to have a strong dig­ital presence than ever before in history. No other medium can give the kind of reach and visibility that a web presence does and making the right impact is the key to success. The brainchild of Tushar Garg & Sunidhi Garg, Directors, Reverse Thought Creative Studio Pvt. Ltd. is a 360-degree digital studio in Mumbai, India. Tushar brings with him 19 years of experience as a Creative Director in the industry with a history of delivering effective communication design combining the latest in design and technology. Sunidhi is an MBA in Marketing and has worked across several indus­tries gaining rich insights and experience. Reverse Thought is currently in its 11th year of operation. Their focus is to help brands communicate and engage with their audiences online through an integrated presence. They provide a full range of creative, strategic and technical solutions like web & app design & development, digital marketing, social me­dia management, and video production. 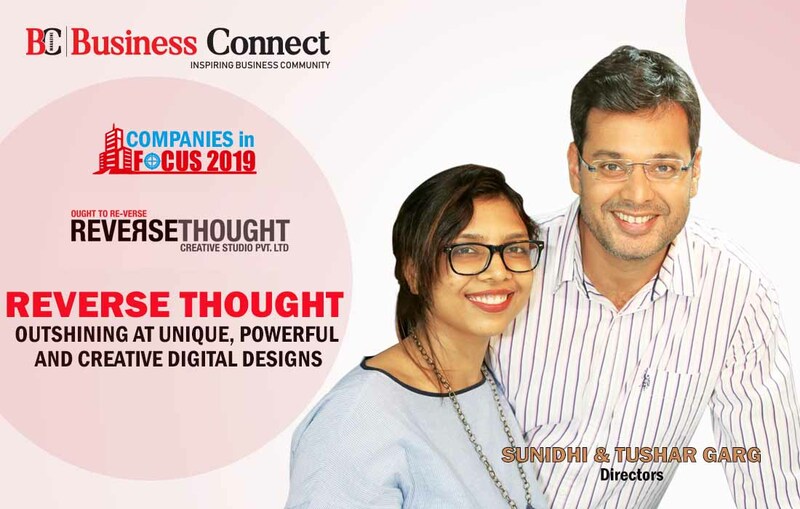 In a conversation with Business Connect Magazine, Tushar & Sunidhi Garg talk about the future plans, outlook, present digital scenario and more. Tushar: Every agency has its own strengths. We at Reverse Thought have always placed a great deal of importance on service, creativity and close adherence to the client’s goals which has led us to produce and very targeted and focused digital properties and campaigns. Our clients trust our counsel, respect our creativity and know that they can de­pend on us in every situation. That sets us apart. Business Connect: Did you see any transformation happening for start-ups, over the years in your field? Tushar: Everyone is looking for ways to automate some part of human life and I think this whole energy is great. Today, there are tools that can allow you to do things on your own. But the element of creativity will remain within the human domain for now at least. Also, customization is something that everyone wants and for that, you cannot re­ally go for cookie cutter products. Sunidhi: Of course, we are not an overnight success sto­ry. But we have been very lucky to get the right breaks at the right time. From our early days itself, we had a lot of recognition on online galleries etc. That was our best mar­keting channel. We’re also extremely grateful for the word of mouth that we receive from our clients. Apart, I don’t think there was anything about this journey that wasn’t enjoyable. Business Connect: What kind of clients do you serve any spe­cial mentions? Sunidhi: All our clients are leaders in their fields & deserve a mention. But to name a few, we work with The United Na­tions Development Programme, ICICI Group, Alkem, Sun Pharma, Goodricke Limited, all cargo Logistics, Welspun Group and many more. We work with large known clients like them as well as with mid and small sized businesses. Tushar: One word – accountability. When we take on a project, we are 100% accountable for the things that fall within our scope. And this isn’t a line. We follow this in spirit and our clients can see that we are committed to our promises. That’s the solid foundation all our relationships are built on. Sunidhi: There are times when we follow trends and there are times when we break them. I think it really depends on what the client’s goals are. We actively track trends but when a project presents itself, we keep in mind what really works rather than follow a trend blindly. Creating a differ­ence is most important to us. Tushar: Definitely we did believe in R&D, it has become an imperative part of your daily business, given that the things are changing so rapidly that you either adapts or perishes. Sunidhi: I’d say it’s with more zeal now. When I started, there were too many distractions in life. With time, work has become the biggest source of inspiration and energy for me. Sunidhi: Very frankly, this has become a very busy space. Entrepreneurs will have to work on a very broad canvas and also be extremely conscious of the ROI as advertising gets more and more competitive. But it will be a fun journey because this space is always exciting. Tushar: Most of the common decisions are taken in a dem­ocratic way in our company. That’s the beauty of being a small team. Also, we have an open door policy and when­ever there is a discomfort regarding anything, people just walk in and discuss with us and they are resolved very well. We strive hard to maintain an atmosphere of freedom, equality, and positivity. Sunidhi: We regularly donate to various charities towards causes of the environment, farmers, defence forces & chil­dren. Also, we have always offered paid internships to young graduates who have been struggling to catch a break. We employ them and train them so that their prospects get better. Some of these young guys who came to us with very little by way of qualification have grown into successful managers with time. Tushar: I love spending time with my family and other than that I also enjoy playing badminton and watch movies, I’m an avid movie buff. Both: We see that the present government has created a great environment. Our sector has very few problems that actually fall within the government’s domain. So not much seems to have changed for us. Looking for expansion in the future with higher pene­tration on the cards, Reverse Thought, is aiming high for the future. The government as well has played a catalyst by introducing the initiatives like ‘Make in India’, after which the IT and software vertical has prospered. The scope that it has bought for the developers and web de­signers are immense and we are looking forward to the digital marketing services witness its revolution in the near future.